NEW POLL: Do Your Children Eat Better Than You? Check out the new poll in the sidebar to the right. It will be open for 2 weeks, so go ahead and vote today, then share with others so we can see lots of results! This topic is in tandem with my new subject posting about our family’s new healthy eating habits. Just a few months ago, I would not have answered the same as I will answer today. Vote now and come back often to check the results! We’ve recently undergone a big change in eating habits around our house. Since May, we’ve basically cut out all processed and packaged foods as well as switched our dairy and meat to grass-fed and free-range, organics. We follow the Dirty Dozen list for buying some organic produce, and have eliminated unclean animal meats such as fish without scales like catfish, shellfish, and pork. You may wonder, how would one start this or get this crazy idea? Well, feeding my boys and this blog were the key factors. Documenting and looking at the healthy choices I was making for them made me question what Jonathan and I were eating. Why was it ok for us to eat something that I wasn’t willing to serve to Owen and Wyatt? Well, I could think of no good reason. We needed a change. 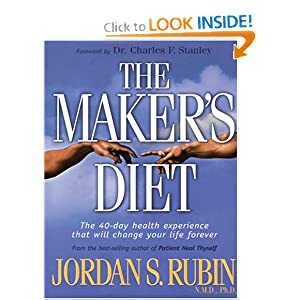 I had read some things online and heard a few things from people here and there, but ultimately ended up reading The Maker’s Diet by Jordan Rubin and have been using that as our general guide. We did the 40-day plan outlined in the book and I wrote some notes about our change and the results. Over the next few weeks, I will publish these thoughts as we look back on our 40 days and time since then. I can tell you that it has been a much-needed and wonderful change. We have both lost weight, feel better, and are happily eating together as a family. We still occasionally eat out, but most of our foods are bought fresh and prepared at home. This may be a general blog transition for me as I work toward the end of the 52 weeks, but I’m not totally sure at this point. I would love to hear from any of you who may be interested in embarking on or already live a lifestyle focused on fresh, healthy, whole foods. I feel like I learn something new every day and each little piece of information is enlightening to me. I’ve alluded to some of these ideas previously and I plan to share some of the basic ideas and principles of healthy full fats, soaking grains, sprouted beans and grains, raw milk and cheeses, meats, and recipes as I go along, but the primary reason will be to document the big change.